Initial Reaction of Book in One Word: ...What? I don't even know where to start. When I post this review elsewhere, I don't know how many stars to rate it. Do you ever read a book that's good and you can't find much wrong about it, but you don't love it or hate it? It's not even just okay; it's just...something. For me, I think The Raven Boys is one of those books. I had very few issues with this book, so that isn't really the problem. I don't even think hype hurt it; there was just something about the book that didn't work for me. There was dialogue that started with "He said..." instead of ending with "...He said," which isn't really a big deal, but when it's constant it kind of bugs me. Also, I noticed some word overusage. For instance, "pregnant." It was used a few times, and not in the way of a baby, so I noticed it. And I wouldn't knock the book down for this, but I don't think I've read a finished copy before with so many errors. (Like missing words, letters, wrong words, etc.) Didn't anybody read this before it went to the printer? One thing I did like was the eclectic cast of characters. There's Blue Sargent, who lives in a house full of psychics but isn't one herself (though she's kind of like an amplifier). And she's kind of cursed to kill her true love. (So, there's a major lack of kissing in this book. Sigh.) She befriends the raven boys: Gansey, Adam, Ronan, and Noah. What was great about the raven boys--besides my liking them--was that they were each their own character and person. I think Gansey and Adam were my favorites, and I think I ship Adam with Blue. I think. Multiple POVs can be a problem for me. If it's not done well, I can get bored. That said, Stiefvater did it pretty well. They were varied enough that I rarely got very bored, and the one POV I cared for least of all wasn't the POV for long, so it worked. The writing itself was fine, though I didn't find it spectacular. (But it wasn't bad. Better than okay and average.) 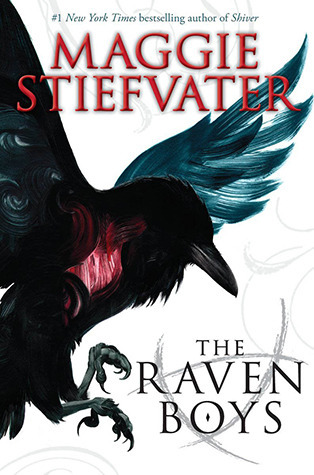 The only other books of Stiefvater's I've read was The Wolves of Mercy Falls trilogy, and I think I liked that much more. The writing and feels were stronger, and I also think I like that genre more. The story and plot itself was...interesting. Going into the book, I'm not sure I quite knew what it was about or what to expect. For quite a few beginning chapters (and throughout the book as well, but not as much as in the beginning), I was really lost. I didn't understand what was going on or why and it just made no sense. I'm still kind of lost on a few things, though it did make more sense as I kept reading. Also, I did read and peek ahead...kind of a lot. But really, that's just related more to my lack of self control and patience with books lately. However, though it took me a while to read this, I did enjoy reading it. It was somewhat fast-paced and I liked reading it. Did I love it? I don't think so. Would I purchase it? Already have it. Who would I recommend it to? Fans of Maggie Stiefvater (and even those who aren't); people looking for a different fantasy; those who have a thing for Glendower. I completely agree with your review, The Raven Boys is the sort of book it's hard to rate because there was so much going on. I actually wish that I could rate the book by each individual character because I loved Gansey but Adam was not a favorite of mine. Can't wait to see what you think of The Dream Thieves!